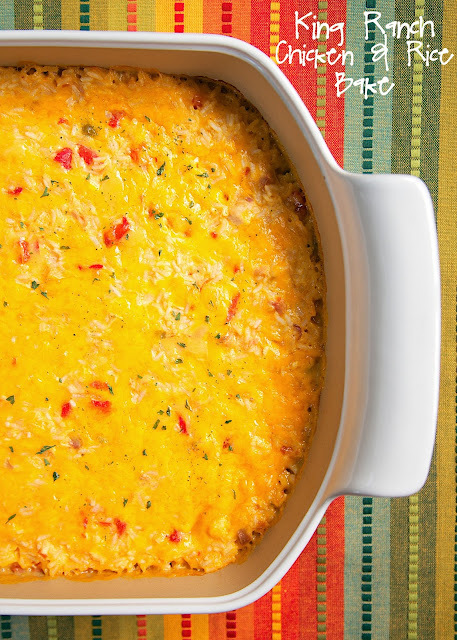 King Ranch Chicken and Rice Bake Recipe - chicken, rice, chicken soup, R-otel, Velveeta - SO good! Ready in under 30 minutes. I wanted to eat the entire pan myself! I have a love affair with King Ranch Chicken. I just can't get enough of the flavors! Chicken, R-otel, Velveeta - YUM! I am seriously addicted! 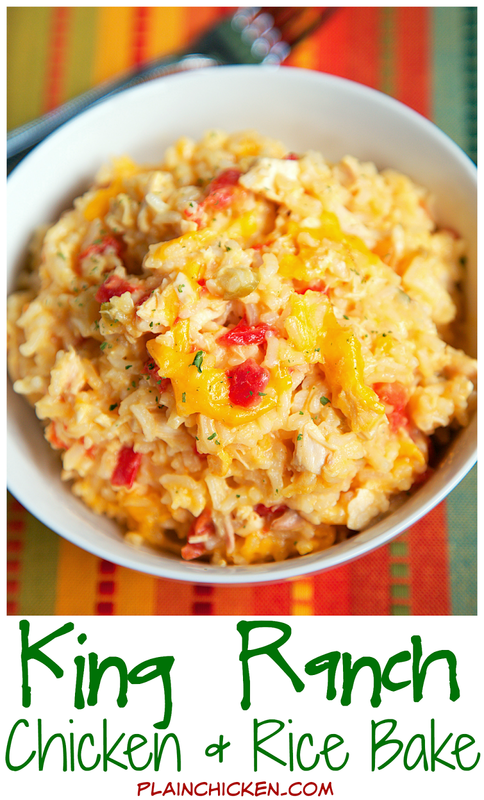 We've made several versions of King Ranch Chicken, but this one might be my favorite! Instead of tortilla chips, we used rice. It was crazy good! This casserole was ready in under 30 minutes. I used my favorite shortcut of rotisserie chicken and this was ready for the oven before it had preheated. You can definitely make this the night before and bake it when you get home from work. You could also just make the rice ahead of time and mix it all together before you bake it. Either way, make this! If you are sensitive to spicy food, make sure to use Mild R-otel. Preheat oven to 350ºF. Spray a 9x13-inch pan with cooking spray. Set aside. In a medium saucepan, bring 2 cups water to a boil. Add instant rice, cover and turn off heat. Allow to stand for 5 minutes, until all water is absorbed. In a microwave safe bowl, melt Velveeta cheese on high 60 seconds in the microwave. Stir in soup, chicken broth and Rotel tomatoes. Microwave on high and additional 1-2 minutes, until smooth. Stir in chopped chicken and rice. Pour rice mixture into prepared pan. Top with 1/2 cup cheddar cheese. Oh this looks wonderful. Love so many of your recipes. They have become family favorites. May I ask how much rice would you use if it is already prepared? I keep cooked rice in my freezer so I can just pull it out to serve and not have to wait for it to cook. 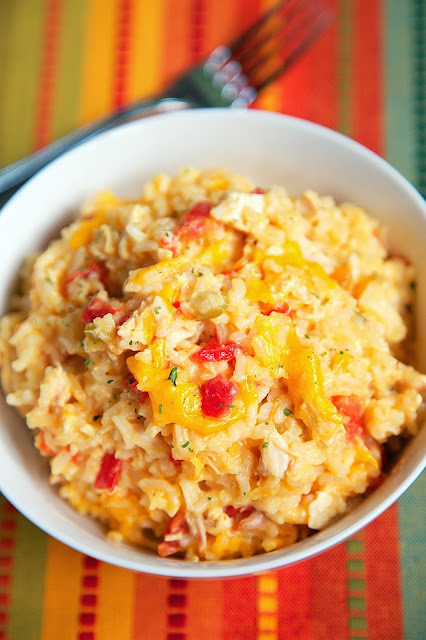 Chicken, cheese and rice - now that's a recipe I can get into. Look delicious. Wonder if the canned chicken can be used? Very stupid question, I know---Do you just use the 1/2 cup of water/chicken broth for the rice OR do we make the rice according to package directions and then add 1/2 cup more in the recipe. Sorry for my ignorance. Marilyn - my directions weren't clear. Prepare rice according to package directions and then add an additional 1/2 cup water or chicken broth to the rice/chicken/rotel mixture. I updated the instructions. Thanks! this looks yummy!! One question...Can colby jack be used in place of the velveeta? Becky - the Velveeta melts easily and makes a real creamy mixture. I've never used colby jack in any King Ranch Chicken recipe. It won't melt the same as Velveeta. This was really good. Probably the best new recipe I've tried in a few months. Thanks! This would also make a really good freezer meal for a friend needing food.